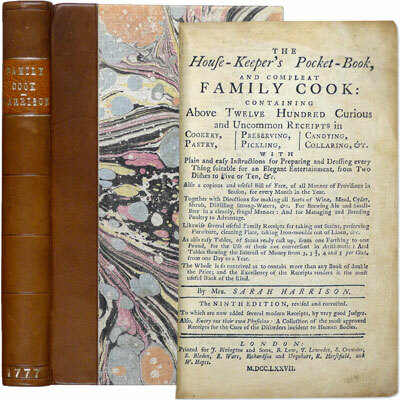 The House-Keeper’s Pocket-Book, and Compleat Family Cook Containing above Twelve Hundred Curious and Uncommon Receipts in Cookery, Pastry, Preserving, Pickling, Candying, Collaring, &c. - with - Plain and easy instructions for Preparing and Dressing every thing Suitable for an Elegant Entertainment, from Two Dishes to Five or Ten, &c. ... Directions for making all sorts of Wine, Mead, Cyder..... - Also - Every one their own Physician - Sarah Harrison 1777 - for J. Rivington and Sons, London - Ninth Edition revised and corrected	Includes 20 pages of tables showing the rate of farthings to l.s.d.f. 6 pages of ‘Tables of Interest’ - Showing the cost of borrowing at 3, 3.5, 4, and 5 percent, over periods ranging from one day to 12 months. Index incorrectly bound before tables. Scarce edition. References: Pennell, My Cookery Books 157. Bitting, Gastronomic Bibliography 217. Cagle, A Matter of Taste 723, 724. Maclean, Household and Cookery Books 66. Simon, Bibliotheca Gastronomica 816. Maggs, Food and Drink Through the Ages (Cat. 645) 238, 275, 296. ESTC notes three copies. Complete as called for by ESTC despite the presence of an erroneous catch-word on verso of A1 [seen on other copies].